Flooding events are rising across European watercourses because of changing climatic conditions and anthropogenic pressure. To deal with these events, the European Floods Directive requires the development of flood risk management plans regularly updated every 6 years, where areas affected by flood risk and relative management strategies should be identified. Along the Directive, sediment transport and morphological changes in freshwater environments like rivers are only marginally considered, leading to a possibly wrong estimate of the impact of floods in the case of watercourses in which sediment transport represents a fundamental component. 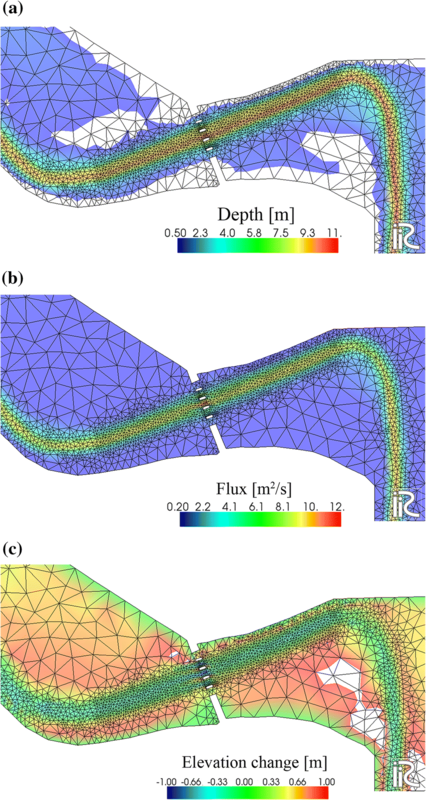 Using the Secchia River in Italy as a case study, the paper compares two numerical simulations performed with the freeware iRIC suite, imposing the same boundary conditions but comparing fixed and mobile bed. The obtained results pinpoint the importance of considering sediment transport in drawing flooding scenarios for alluvial sandy rivers. As suggested by this example, for the incoming revisions of the flood risk management plans, forecasted by 2021, water managers should account for the dynamic behaviour of surface watercourses, considering sediments not only as a driver of pollutants but also as a key aspect that shapes the environment and should be considered in modelling future scenarios and drawing associated management strategies. The quality of European rivers is one of the most important concerns for the future, as recognized, under a legislative point of view, by the Water Framework Directive (WFD) at the beginning of this century (EU 2000). Such Directive represents a new holistic, integrated approach to water protection, requiring, among other obligations, the classification of watercourses based on reference conditions. As described by the Directive, in fact, deviations from reference conditions are assessed by means of biological, hydromorphological and physicochemical quality elements, but only rivers classified in high status must achieve hydromorphological characteristics totally or nearly totally corresponding to undisturbed conditions when accounting for sediments (Nones et al. 2017). Thus, following the Annex V of the WFD and the CIS Guidance n. 13 (CIS 2005), EU Water Authorities categorize water bodies as achieving good, moderate, poor or bad ecological status only based on biological monitoring results, neglecting the consideration of hydromorphological quality elements and sediment transport for stream which are not in a high status (Nardini et al. 2008). On the other side, however, sediments and associated transport processes are of great relevance due to their ecological (e.g. aquatic habitats, shelter area for fish), energy (e.g. reservoir sedimentation) and risk-related (floods and debris flows) effects (Habersack et al. 2017), given that sediment fluxes provide the basilar hydromorphological conditions to support dynamic aquatic ecosystems (Brils 2008; Fryirs and Brierley 2013; Wohl et al. 2015, Gurnell et al. 2016; Hajdukiewicz et al. 2017). As an example, the WFD mentions river continuity not only for biota but also for sediments, although the improvement of such continuity is still a challenging topic for water managers (Habersack et al. 2016). Inadequate considerations of fluvial morphology and sediment transport have also important implications for the Directive 2007/60/EC on the Assessment and Management of Flood Risk (hereafter called Floods Directive-FD). Developed accordingly with the WFD, this Directive aims to reduce and manage risks that floods pose to human health, environment, cultural heritage and economic activities (EU 2007), but giving open room to methods that can be applied to achieve these goals (Albano et al. 2017). According to the Directive, each member state must follow three steps during its implementation: (1) preliminary flood risk assessment, (2) flood hazard maps and flood risk maps and (3) flood risk management plan for each catchment (Nones 2015). The latter step is crucial, as it institutionalizes an ongoing paradigm shift from flood protection towards flood risk management (Bubeck et al. 2016; Roos et al. 2017). Although the Article 6.5d of the FD suggests drawing upon additional information regarding the impact of sediments and debris floods in the preparation of the flood maps (EU 2007), after the first implementation cycle ended in 2015, several shortcomings and weaknesses were evident, including a lack of theoretical risk management knowledge (Kallis and Butler 2001; EU 2015; Norén et al. 2016), inadequacy in considering hydromorphological alterations and sediments impact on flood risk management (Nones et al. 2017), incomplete understanding of cascading effects of floods (Pescaroli and Nones 2016). Such shortcomings need to be addressed in the short term because, by 2021, the next flood risk management plans (FRMP) should be produced, containing information on progress achieved towards the Directive goals (EU 2007). Typically, alluvial channel is dynamic systems having erodible boundaries, self-adjusting to a variation of liquid and solid discharges supplied from upstream (see, among many others, Leopold and Maddock 1953; Schumm and Lichty 1965; Yalin 1992; Singh 2003; Nones and Di Silvio 2016; Slater 2016). Because a flood starts when water levels in the main channels are sufficient to exceed the bank height, locally flood risk is driven by changes in river channel stage, which may be impacted upon by variations in both flow magnitude and river channel conveyance (Lane et al. 2007; Neuhold et al. 2009), especially when considering a series of repeated floods instead of a single event (Guan et al. 2016). Geomorphological alterations and sediments moving in rivers impact the flood frequency and can increase it through the following: (1) reduction of the channel capacity (Slater et al. 2015); (2) morphological adjustments in response to a variable sediment supply from upstream (Lane and Thorne 2007); (3) bed aggradation and erosion due to damming and backwater effects (Walter and Merritts 2008; Maselli et al. 2018). Researches about flood risk are typically associated with extreme hydrological events, assuming only clear water and non‐erodible channels in implementing two-dimensional (2-D) hydraulic models to prepare FRMP (de Moel et al. 2009; Alfieri et al. 2014; Nied et al. 2017). 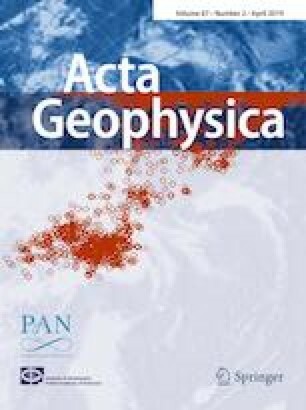 However, geomorphic processes and anthropogenic alterations of the topography (Costabile and Macchione 2015) can mediate and eventually increase the impacts of extreme happenings and backwater effects (Guan et al. 2016; Bohorquez and del Moral-Erencia 2017). Moreover, management practices can change the flow regime of a catchment, determining its geomorphological behaviour and its response to flooding events (O’Connell et al. 2005; Wheater and Evans 2009), especially along floodplains that are dynamical systems subjected to cyclical erosion and deposition phenomena. River systems show a great spatial interactivity: flood defences built upstream can change the sedimentary load at the watershed scale, causing several problems for humans and infrastructures located downstream, such as increasing the siltation in hydropower reservoir or changing the river bathymetry, increasing the water level locally and consequently the flood risk (Merz et al. 2014; Liu et al. 2018). These interactions can be represented in numerical models for assessing future scenarios, but an engineering understanding of the main processes like long-term morphological changes is quite limited and relatively difficult to schematize (Sayers et al. 2002). Based on that, typically flood risk models do not account for sediment-related processes, driving to possible underestimations of flooded areas and associated depths (Nones and Pescaroli 2016), also because of the lack of detailed sedimentological data on both bedload and suspended load that should be used to accurately calibrate these modelling tools. In the literature, less attention has been paid in the evaluation of the impact of in-channel morphology on flood risk and inundation extent (Sinnakaudan et al. 2003; Radice et al. 2016), although researches based on historical data and geomorphic analyses highlighted that an increase in the flood risk can be correlated not only with an increase in flow discharge, but also with a reduction in the channel conveyance (James 1999; Stover and Montgomery 2001). High sediment delivery ratio can be the necessary drivers for increasing flood risk, due to the reduction in the cross sections after sedimentation (Korup et al. 2004; Pinter and Heine 2005) or the alteration of the river pattern (Sinnakaudan et al. 2003). Recent works verified the effects of channel adjustments on the hydraulics of flood either by field observations (Rickenmann et al. 2015; Wyzga et al. 2015) or by using numerical modelling (Li et al. 2014; Guan et al. 2015; Staines and Carrivick 2015). These studies suggested that the influence of sediment transport and the subsequent morphological changes of the river can be a key driver of flood hazard. Because of the complexity of hydro-morphodynamics models, nevertheless, before applying a specific code a thorough study of the water body is required. Indeed, historical geomorphic analyses can inform on selecting the most adequate modelling tools (e.g. geomorphic, hydraulic, morphodynamic), providing a better understanding of how river morphology, in planform and section, evolved. Such preliminary studies permit an estimation of the impact of considering only clear water or also accounting for the sediment transport in computing the flood risk, helping the water managers in choosing an ad hoc monitoring and modelling approach (Brierley and Hooke 2015; Warner et al. 2018). Trying to add additional insights to the ongoing debate about sediments and flood risk management in alluvial watercourses, the paper presents an application of the freeware code iRIC to a small reach of the Secchia River, a lowland tributary of the Po River in Italy. The study is performed considering a single flooding event, highlighting the impact that sediment changes have locally and at the short time-scale. After the description of the study site and the adopted model, the results show that the sand transported along the watercourse deposits on the floodplains during low-flow conditions, reducing the cross section and increasing the likelihood of floods. Aside from the presentation of these specific results, missing points in the Floods Directive, like the consideration of sediment transport, are here discussed, suggesting the adoption of a broader vision in adopting flood risk management strategies. The Secchia River is a right-hand tributary of the Po River and flows through the Emilia-Romagna Region in northern Italy (Fig. 1a). It is around 172 kilometres long and has a drainage basin with a catchment area of about 2300 km2, with climatic conditions alternating between aridity in the dry summer months and higher flows during the wet periods, typically in spring and autumn. Being an important waterway since the ancient times, this watercourse has been diverted from the natural course to its present path during the XIII–XIV centuries, and now it flows through a highly anthropized environment, catching pollutants from the agricultural surroundings (Pescaroli and Nones 2018). To emphasize the importance of sediment transport and deposition/erosion phases on the flood risk, the lowland area close to Ponte Motta is modelled with the freeware code iRIC, using as geometrical input a digital terrain model (DTM) derived from LIDAR data and bathymetric surveys taken in 2015 (Fig. 1b). The domain is discretized using unstructured grids having cells between 10 m2 close to the bridge to 100 m2 elsewhere. Regarding the hydrological data, they refer to a flooding event happened in January 2014, having a return period of around 20 years, and discharges and water levels as upstream and downstream boundary conditions, respectively, are imposed. The simulated event has a total duration of 13 h, while the given hydraulic data are hourly, and spans between 250 and 290 m3/s at upstream, corresponding to a downstream level that rises from 8.5 to 9.4 m. The composition of the material transported and deposited along the floodplains is derived from site-specific field samples performed in 2016, corresponding to fine/medium sand. 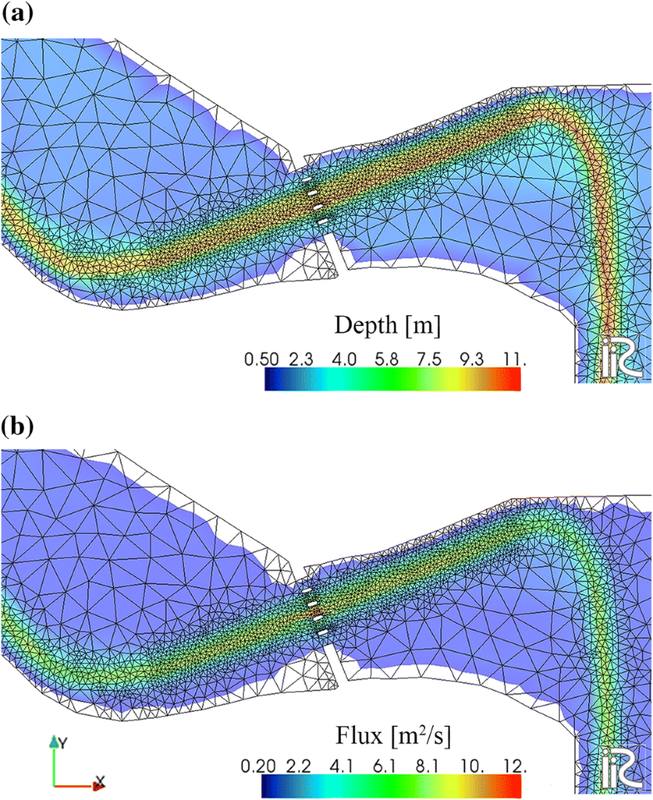 The present study uses the solver Mflow_02 of the freeware suite iRIC version 3.0 (https://i-ric.org/en/), which allows the user to reproduce the riverine hydro-morphodynamics using unstructured grids and finite element method, which can solve the 2-D vertically averaged unsteady flow and river morphodynamics equations (iRIC Software 2014; Nelson et al. 2016; Nones et al. 2018). By applying the typical characteristics of unstructured meshes, Mflow_02 computes the unsteady flow in areas including hydraulic structures like bridge piers and can model flooding events over complex areas such as floodplains. In addition, the solver allows for computing river bed variations as well as bedload and suspended load along the reach by means of several sediment transport equations. Among many others, some characteristics of the code are: (1) the domain can be discretized using unstructured meshes having linear triangular elements; (2) the Galerkin finite element method is applied for solving the spatial derivatives; (3) the model is explicit in time; (4) the turbulence field is solved using a k − ε model; (5) the user can model suspended load and bedload separately; (6) the code accounts for a multiple grain size composition of the river bed and transported within the water column. The Galerkin finite element method permits the spatial discretization of the flow continuity and momentum equations, adopting linear triangular elements as shape functions to weight the residuals. The turbulence field is represented by the flow with large and small eddies, by means of the k − ε model (iRIC Software 2014). The kinematic eddy viscosity is directly computed, without solving the transport equations. The turbulent energy is evaluated as a function of the water depth (Nezu and Nakagawa 1993), while the approach suggested by Lomax et al. (2013) is applied for deriving the energy dissipation rate from the water velocity field. The bottom friction is set up using the Manning’s roughness coefficient, here changing between the main channel and the floodplains, following a preliminary calibration (Pugliese 2017). To describe the morphodynamics, the model uses a mixed grain size deriving from a few sediment samples made along the Secchia River. Because there are no direct measurements of the sediment transport, it was divided into suspended load and bedload, both assumed in equilibrium with the water flow. This simplification involves a direct adjustment of the solid phase to variations of the liquid phase, without accounting for possible time lags between the two phases. For each grain size, the bedload is computed using the Meyer-Peter–Muller formula, while the suspended load is calculated following the Einstein approach (Einstein 1950). This method permits to determine a representative particle diameter of the suspended sediment (van Rijn 1984) and, based on it, to compute the velocity of buoyancy of each grain size. The reference conditions for the concentration are calculated by means of the Rouse formula (Rouse 1937). Moreover, the mixed grain size composition is handled considering the shelter effect (Ashida and Michiue 1972) and assuring the continuity for all the sediment classes. Additional information on the mathematical background is reported on the software website i-ric.org/en/. Given that the main aim of the paper is to discuss the importance of considering sediment transport and related phenomena of erosion/deposition in flood risk modelling and associate drawing of FRMP rather than presenting the application of a flooding forecast model, no further details on the modelling structure or the input data are here reported. For the sake of clarity, it is worth mentioning that the model was calibrated against historical flow data and compared with previous analyses (D’Alpaos et al. 2014). At the same time, sensitivity analyses of the used grid and time discretization were performed, comparing the simulations having a fixed bed with the measured data (Pugliese 2017). However, given the lack of information about sediment transport, the present application is affected by some uncertainties, which are considered not affecting the overall behaviour. To evaluate the importance of sediment transport and river morphodynamics on the characteristics of flooded areas (extension and depth, and consequently on flow velocity), two sets of simulations were performed, using the same hydrological input but a changing bed: fixed and mobile. While the first set uses, as boundary conditions, only the geometry (DTM) and the hydraulics (i.e. discharge and water depth), the second one assumes that the river can mobilize the material from the river bed and floodplains and transport it along the main channel in equilibrium with the flow phase. Imposing a computational time step of 0.1 s for assuring the code stability, each simulation lasts around 4 h to simulate the 13 h of the event, with a few effects of computing the solid phase on the computational workload. The first simulation was performed assuming a fixed bed of the river (i.e. no consideration of sediment movements and erosion/deposition along the main channel and floodplains). Based on the boundary conditions described above, the iRIC Mflow_02 code permits to simulate the 2-D temporal evolution in terms of water depth and flux (specific discharge), providing the information for each cell. As visible from Fig. 2a, following the geometry close to the bridge piers, the water depth reaches values higher than 8 m, as usual in the main channel of the Secchia River during flooding events. The flooding wave, however, has a minor impact along the floodplains upstream and downstream of the bridge, where the water flows very slowly, with a maximum depth of around 50–100 cm. A higher flow current within the main channel is confirmed by Fig. 2b, where the specific discharge (flux) is reported. One can notice that the higher flux is concentrated between the two central bridge piers, causing a higher water level. After overflowing the levees, the flow is practically standing along the floodplains. Although the Emilia-Romagna Region is highly industrialized, these areas close to the watercourse are not yet inhabited but have still a very high economic value as pastures and agricultural field, being this region one of the most agricultural ones in Italy. Therefore, even flooding happenings characterized by a relatively low return period, like the one analysed here, can have a significant impact on the river surroundings with several consequences both on the environment and on the economy (Pescaroli and Nones 2018). Accounting for sediment transport and morphological variation during floods can lead to results quite different from considering only clear water flowing over a fixed bed, in particular in the case of active sandy or gravel river beds. In fact, as visible in Fig. 3, even a single flooding event, sufficiently relevant but not extreme, can change the bathymetry of many centimetres, slightly increasing the depth in the main channel due to erosion and the bed elevation of the floodplain following a deposition. With such conditions, at the end of the simulation, water depths over the flooded areas are reduced with respect to the previous simulation (Fig. 3a), even if the water flows over all the domain during the water peak and then stay there because of the increase in the river levees after sand deposition (Fig. 3c). The flux on the floodplains is slightly higher (Fig. 3b) and reaches regions not affected in the case of fixed-bed simulation and is therefore possibly not accounted for in drawing flood maps. Moreover, the overflow caused an increase in the elevation of the floodplain of about 50–70 cm, driving to a future knock-on effect. Indeed, traditionally, sediment transport is considered as a kind of local alteration in time and space with respect to an equilibrium channel morphology, where cross-sectional areas adjust to a characteristic (bankfull) discharge. When sediments are delivered, it is thought to be a matter of time before river capacity re-establishes itself through transport of the solid component downstream along with the river system. However, as suggested by the present study and a few examples in the literature, this overlooks extensive geomorphological evidence due to floods, potentially rapid over short time periods (Macklin and Lewin 2003). The aggradation of the floodplains can reduce the room for the river in the case of subsequent flooding happenings, potentially increasing the likelihood of future overflowing, especially downstream. Geometrical changes in the Secchia River and the neighbour inundated areas depend upon both the magnitude of the flooding event and the type and quantity of sediments moved by the flow. In fact, considering fixed or movable conditions drive of significant differences in flooded area extents and associated water depths in the whole area, eventually affecting the resilience of the region interested and the management techniques that should be adopted to address this kind of happenings. In addition, as visible, the transported material can be picked up from the bed, moved within the current and deposited along the floodplains, potentially altering the entire aquatic environment and affecting the WFD classification, which is based on aquatic flora and fauna (EU 2000), ultimately driving to inconsistency in defining the river status. Therefore, for the next river basin management plans, a coherent modelling of water–sediment interactions is also necessary and desirable. However, as already mentioned, the present model was calibrated only against hydrological information (water levels measured at the Ponte Motta bridge), while it was not possible to accurately calibrate the sediment transport because of the availability of only a few bed samples but no distributed information about bedload and suspended load. Thanks to very recent flow field and concentration data captured with a horizontal ADCP (Acoustic Doppler Current Profiler) having a frequency of 600 kHz during the period November 2017–January 2018, it is planned to rerun the model calibrating both the liquid and the solid phases, aiming to provide more reliable quantitative information to local water managers and to confirm these preliminary outcomes. 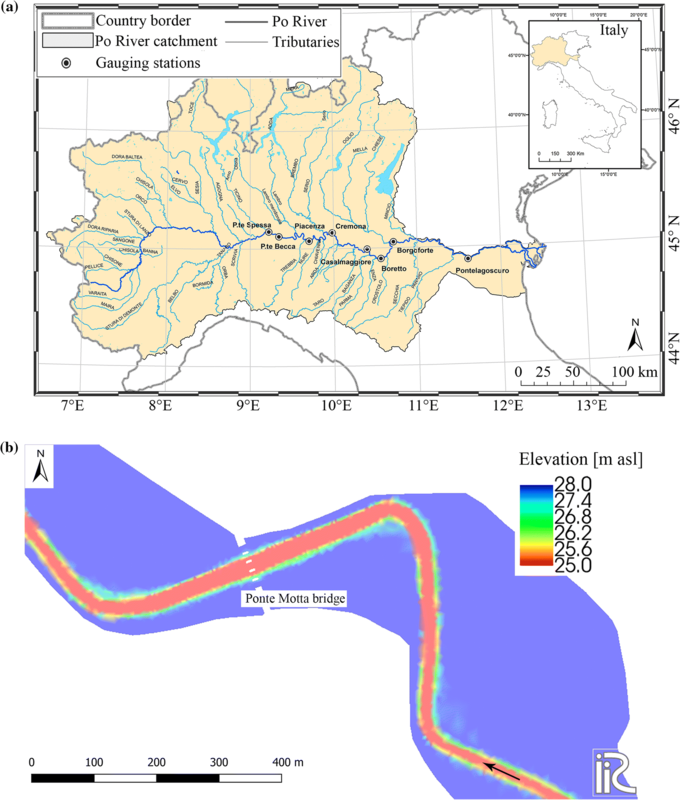 This paper presents a first application of the freeware hydromorphological model iRIC Mflow_02 on the Secchia River in Italy. Despite some uncertainties due to the lack of proper calibration data on the solid phase, the outcomes clearly pointed out the importance of considering sediment transport and morphological variations (erosion and deposition) in modelling areas affected by flood risk, aiming to produce adequate and reliable FRMP. While based on a single and relatively simple case study, the research presented here highlights important implications for flood risk assessment and river management, which could be valid more generally. As visible by comparing the two simulations made with fixed and mobile bed conditions, indeed, sediments can have multiple effects, depending on the flood event type and its duration. As a matter of fact, even the modelling of a single flooding happening at the local scale can be affected by the presence of sediments, which are moved by water from the main channel and deposited along the floodplains, changing the channel capacity and therefore driving to a possible increase in the flood risk and the residence time of water on floodplains. Usually, such considerations are not made by water managers, who simply follow the EU legislation and produce maps and plans in agreement with the WFD/FD requirements, using modelling tools that do not account for the presence of sediments as boundary conditions or drivers of large-scale changes. In many cases, neglecting sediment transport and bed variations cannot affect the characteristics of the flooded areas (water depth, extension, water velocity, etc.). However, in the case of very active rivers, like the lowland ones composed by fine sand that can be easily transported also by low water levels like the one presented here, but even in the case of mountainous gravel-bed streams, neglecting the effects of sediments can result in an underestimation of the flood risk, with important consequences under an economic and social point of view at manifold spatial and temporal scales. For the next FRMP, which should be produced by 2021, water managers must adopt a broader vision, incorporating the effects of sediments and considering the watercourse that they should model as a dynamic system, affected by many drivers that can change its characteristics. Overcoming the representation of nature as a fixed system should be the best way to reduce the impact of flooding events, moving from post-event (emergency) intervention strategies to flood risks management policies. Ultimately, future studies should address the geomorphological processes in flood risk management in a proper way, using historic geomorphic analyses as a starting point and, based on them, adopting adequate tools (mostly already available) that can predict the medium-term (annual to decadal) response of river beds and banks to sediment delivery, aiming to assess the flood vulnerability. This should include considerations of those types of fluvial systems where aggradation issues are relevant, like the one analysed here. The author would like to thank all the colleagues involved in the INFRASAFE project for the fruitful discussions and the preparation works that contributed to the development of the ideas reported in the manuscript and, in particular, Alessio Pugliese. The author is very thankful to the reviewers for the helpful comments received. This study has been partially developed within the INFRASAFE project (www.infrasafe-project.com), financed by the Emilia-Romagna Region (Italy) under the Por-Fesr 2014–2020 Programme. Part of this work was also supported within statutory activities No. 3841/E-41/S/2018 of the Ministry of Science and Higher Education of Poland.